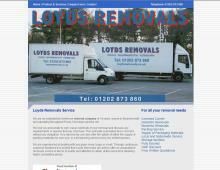 Loyds Removals is a family run removal company in Bournemouth, Poole & Ferndown which has over 14 years experience. Expect top quality removal services in Poole, Bournemouth, Parkstone, Branksome and Ferndown as shown on Loyds Checkatrade ratings and testimonials. Andy Loyd will visit you to give a professional removal quote free of charge and explain the removals process. Loyds can offer full packing services or just provide packing boxes for you to pack prior to your moving date. Secure storage is also available with 24 hour CCTV monitoring. Loyds removals and storage services in Poole, Bournemouth & Ferndown are ideal should you be re-building or extending your home. Loyds provide professional removal services from all areas of Poole, Bournemouth and Ferndown to anywhere in the UK. Contact Loyds Removals for a free quote today!